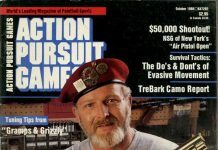 Lou Grubb, of Gramps and Grizzly, on the cover of the October 1988 Action Pursuit Games, holding the Gold Nightmare that they were given by Aldo Perrone. 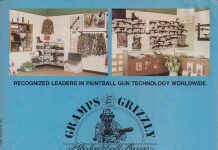 A Gramps and Grizzly ad that was printed in the December 1990 issue of Paintcheck magazine shows the Enforcer 1, the NW Comp, BE King Cobra and the SMG60. 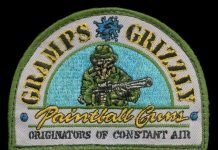 Lou and Mike Grubb, aka Gramps and Grizzly, have agreed to meet with me and record some of their paintball history. 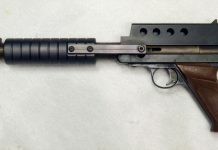 A polished internally and externally modified Brass Eagle Eagle. Mike Grubb of Gramps and Grizzly tried everything to get this Brass Eagle Eagle cycling. 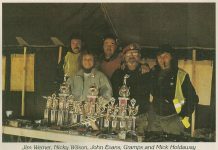 A scan from the May 1990 issue of Paintcheck shows Mike and Lou Grubb, Nicky Wilson and Mick Holdaway at a tournament at Mick's field, Simulated Activities. 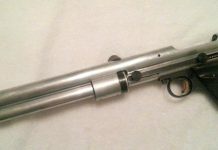 Several photos of a KBS Eliminator I discovered on the shelf of Mac 1 Airguns. 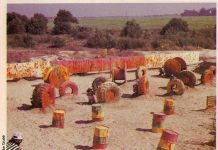 One of Gramp's and Grizzly's first creations, this was an amazing find! 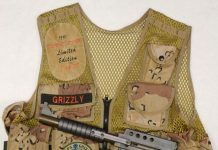 Here is a better pictures of the KBS Eliminator that was on the shelf at Mac 1 on top of Mike ''Grizzly'' Grubb's Idema vest (edit: the vest was in my closet not at Mac 1).